check out The Astoria, this beautifully Unique Trunk! We think it would work nicely at the end of a bed, or as a coffee table! 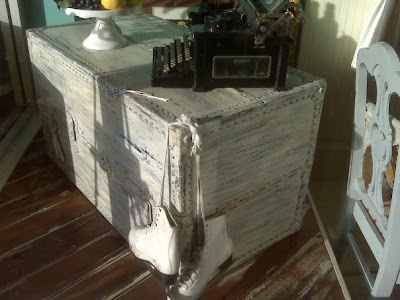 This cool trunk is new in store, and has just been custom designed for your home! 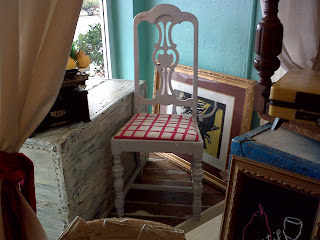 Very sturdy with colors of antique cream, blue & black. In addition to being an interesting accent piece, it instantly creates extra storage ... blankets & quilts ... kids toys ... sports stuff ... lots of alternatives. Its light, sophisticated, and creamy colors offset the size and lighten it up as a décor feature. Don't forget, we specialize in furniture revamping. You can always bring in a piece of your own as well and we can charge just for the service! All of our pieces are one-of-a kind, signed and dated. This item is affordably priced at $250. Give us a call with questions, or if you're in the neighborhood ... just stop by! our friends, family and clients! 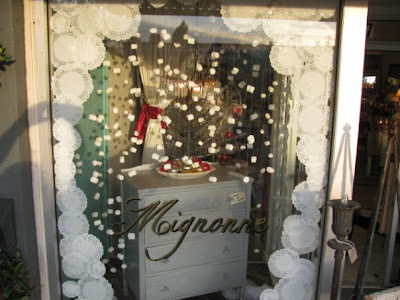 This is a view of our Holiday Window courtesy of merchandising intern Rebekah Carey McNall ... don't you love the snowmallows? Can you believe it? Our FOURTH Annual Holiday Reception & Sale is Here! Our traditional Reception & 25% Off SALE! *A SNEAK PEEK at Mignonne's new furniture partnership with Gina Pericini ... custom order chairs designed and hand finished to your request. * Of Course, enjoy 25% savings on everything in the store (except original artwork) ... and we have loads of great choices for unique & special items for the season, like our signature vintage glassware ... perfect for gifts or to dress up your holiday tables! * holiday raffle - win one of our great gifts! * FREE consultation on furniture projects. Get inspired ~ check out our amazing furniture selection and brainstorm with Johnelle to get a jump start on your Spring design & décor ideas. Please be our guest for this year's holiday reception ... we can't believe it will be our 4th year of celebrating with our friends and family! We have a lot to be thankful for ... continued success during a challenging year, enjoying a wonderful new location, seeing our furniture business blossom ... and working with an ever-growing group of terrific friends and customers to bring affordable beauty into their daily lives! We'd love to share a toast with you ... come and enjoy some music, our traditional big savings for the event, some laughs and good cheer. Turquoise! 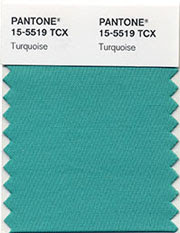 Pantone just announced their 2010 Color of the Year and it is Turquoise ... of course, here at Mignonne, we ADORE turquoise. It is one of our signature colors. Our original shop had this shade on the walls and we've incorporated into our new boutique as well. Turquoise is a calming and sophisticated shade. It blends well with many of its companions on the color wheel. It can be dressed up and modern, as when paired with chocolate. It can get down and funky, as when distressed on wood. Or it can go local and tropical ... girly and pastel ... electrically disco. And all take beautifully to your individual design schemes. We can help you decide where and when to bring the 2010 color of the year into your décor plans. 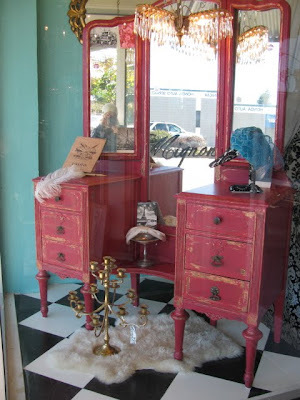 and then customize the furniture or décor item to meet your needs. We'll be bringing you more about turquoise in future updates. 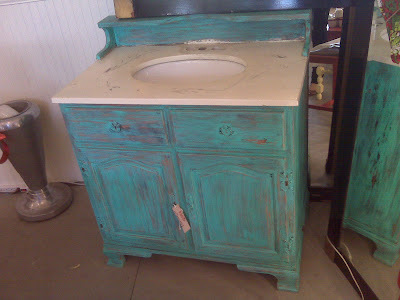 For now, check out one of our newest pieces in store ... with, (of course), turquoise touches ... a neat old vanity complete with sink.